Cross-posted from co-founder Emily's blog, West of the Loop. Emily's swap offerings had a citrus theme. For most Americans, February 3 was Super Bowl Sunday. For me, it was Super Swap Sunday. The Chicago Food Swap held its first event of 2013 on Super Bowl Sunday not as deliberate counter-programming, but merely for lack of a better date. The conflict with the Big Game did mean that some of our veteran swappers were not able to attend and we missed their delicious items — I mean, we missed them. However, we did not have a hard time filling our 40 available spots with a healthy mix of repeat swappers and newcomers. The percentage of first-time swappers was higher than usual due to a very exciting mention on The Tasting Table’s Chicago events page. This little bit of publicity to the food-obsessed readers of that publication not only brought us enthusiastic new swappers, but several promising offers to host future swaps from local businesses. Touchdown us! The host for the February Super Swap, as I am going to insist on calling it, was Katherine Anne Confections, a Chicago candy company that makes mouth-watering truffles, caramels and marshmallows using only the finest ingredients, including local and organic wherever possible. Katherine Anne Confections are sold at specialty markets all over Chicago and it also has an adorable storefront in Logan Square, where locals pop in for mugs of unctuous hot chocolate and pastries. Katherine Anne Confections is a perfect business for the Chicago Food Swap to partner with because owner Katherine Duncan started, like the swappers themselves, making her candies as a hobby. She honed her craft over time and began to sell her decadent treats. Now she runs one of the most successful artisan candy companies in the city. What an inspiration for those of us toiling away in obscurity in our kitchens! As always, I was amazed at the diversity and creativity of the offerings. If you were there to indulge your sweet tooth, you had only to chose between cherry hand pies, chocolate stout cake (made with beer! ), sea salt caramels, scones, Valentine sugar cookies, raspberry hazelnut macaroons, caramel corn, chocolate-caramel brownies and cupcakes made by Katherine Duncan herself. But if you were there looking to feed your family healthier fare, you were also in luck. Among the savory offering were chicken and beef empanadas, veggie beef soup, beautiful breads like foccacia, challah and naan, fresh farm eggs, multiple varieties of hummus, granola, cheese crackers and homemade yogurt. 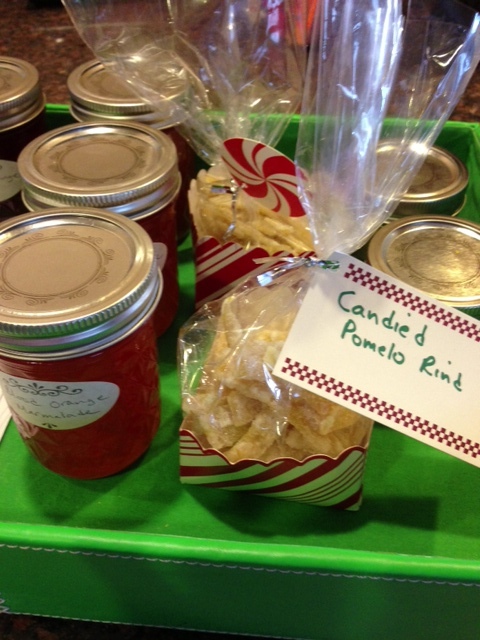 As always, the canners in the group showed off their talents with stunning jams, jellies, curds, salsas, relishes, pickles and marmalades. One of the most unusual items was a homemade wine vinegar, fermented by veteran swapper Lissa. I was intrigued by the homemade wine vinegar. I had a theme for my swap offerings: citrus. I brought blood orange marmalade, blood orange syrup, citrus sugar, candied pomelo rind and Rangpur lime curd. I traded it all away for six dozen farm eggs, a 1/4 bag of caramels, a box of cheddar crackers, a jar of whole milk yogurt, some white bean hummus — no sesame! — cranberry pepper jelly, a chocolate stout mini-Bundt cake, a cherry hand pie, four chicken empanadas, and foccacia — enough to keep my family snacking all week. Upon leaving, everyone asked when the next swap was going to be. The answer is that we are planning one for April 7. There might be a chance that we could do one sooner. If you are interested in participating, the best way to keep abreast of our events is to become a fan on Facebook. If you want to join a food swap in your area — or perhaps start one — your best bet is the Food Swap Network. 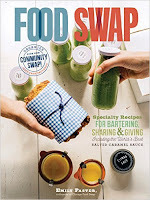 Founder Emily Paster's book about how to join the food swap movement is now available. The Chicago Food Swap is an organization dedicated to bringing together cooks, bakers, canners, gardeners and foragers to trade homemade and homegrown foods. No money changes hands and all the participants are individuals trading items that they made or grew themselves. Along the way, we hope to forge new friendships and trade inspiration. Hope to see you at the Swap! See our photos on Instagram.